I like to listen to Hindustani classical music. The various moods created by this music are simply unique. This music can relax your tired nerves. It can invigorate you with burst of energy. Specific RAAGA always relates in your mind to a specific time of the day or to a specific season of the year. The same RAAGA rendered by two artists appears totally different. The same RAAGA can be rendered by both male and female voices, Which differ so much in their pitch. I was always curious about technical basis of this music. I therefore decided to carry out a study and here are my observations. Sound energy is propagated in the form of a pressure wave. This wave therefore has a Pitch or a Frequency. The sound radiating from an instrument like a Tanpura have 4 or 5 basic notes of a single frequency each, while a single note produced by human voice,usually consists of several frequencies called harmonics. However in this case also ,there is always a single predominant frequency. This single or predominant frequency sound is called a note or SWARA. A young person can usually hear sound notes over a frequency range of 20 to 20,000 Hertz or cycles per second. The human voice box, however can only produce sound frequencies over a very limited range. A young adult male can produce sound notes over a frequency range of 80 to 700 Hertz. A young female voice is more versatile. It can produce notes over a frequency range of 140 to 11000 Hertz. A single note can not create music. We need to have a series of notes or SWARA. Further, the individual notes used in a series, should be such that when listened together, a pleasant experience results. Hindustani as well as western classical music is made from seven individual notes. The eighth note which follows is of double the frequency of the first note. 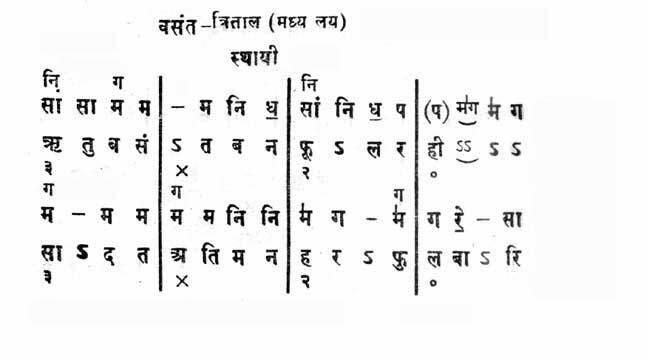 This series of notes is called an Octave or SWARA-SAPTAK. The individual notes in an octave are denoted as Sa, Re, Ga, Ma, Pa, Dha, Ni.. After Ni comes Sa', this time, double in pitch ,compared to the first Sa ,i.e. an octave higher. The individual notes in octaves, follow the simple geometric progression of scales ,with a note frequency being 1.5 times the fifth earlier note frequency. The same notes in western classical music are denoted as A,B,C,D,E,F,G. Out of the wide variety of musical instruments available, a piano perhaps produces sound notes having frequencies over a very wide range. The first white key (on left) produces a frequency of 27.5 Hertz where as last white key (on right) produces a note of 4186 Hertz. It can therefore reproduce musical notes over 7 octaves. The middle C4 white key is important because it produces a note of 261.63 Hertz. A sound note of this frequency can be easily produced by the male human voice. 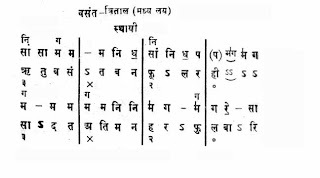 This note is therefore denoted as basic 'Sa' note in Hindustani classical music and the octave beginning with this note is called Madhya saptaka. The octave below is called the Mandra saptaka and the octave above is called the Taara saptaka. Most of the good singers have a voice which spans over all three octaves. Even though, there are 7 basic notes in a saptaka, 5 more notes are added to complete it. Thus each saptaka has 12 individual notes. The additional notes are small variants of the basic seven notes. The frequencies of Re,Ga,Dha,&Ni basic notes are slightly lowered to get Komal or Flat notes. The frequency of Ma is increased slightly to get 12th note of Teevra or Sharp Ma for that Saptaka. Following table gives the frequencies denoted to the notes of these three basic octaves. Even though Madhya Saptaka notes denoted as 'Sa' and 'Pa' are considered as reference notes. It is not at all necessary for a singer to adhere to these notes as reference. The artist according to his voice or instrument can set the reference note or 'Sa' of a different frequency. Usually, Male artists use frequencies of 261Hz or 277Hz as their reference note. The female artists use frequencies of 370Hz or 415Hz as their reference note. For male singers the frequency spectrum remains more or less same but for female singers the frequency spectrum shifts up as given below. A male singer, while rendering a RAAGA, can therefor span notes within a frequency band of 130 to 990Hz. Whereas a female singer can span frequency band of 185 to 1400Hz. I think that this is the primary reason for the same RAAGA, when rendered by two artists, to appear different. This flexibility in rendering makes Hindustani classical music so pleasing to the ear. A RAAGA is usually a combination of 5 to 7 notes. The combination may remain same or may change while going up or down the frequency spectrum. This combination usually is in the madhya saptaka. The artist can however use similar notes in higher or lower octaves while rendering. This can produce breath taking or spectacular results. This combination also gives the mood to the RAAGA. In this combination there are some principal notes and the artist is supposed to adhere to these notes. This in short is the technical basis of Hindustani classical music.